Action-RPG game Moonlighter, following the surprisingly intriguing life of Will — a shopkeeper by day and an adventurer by night — has set its release date! Joining the download versions, retail editions both standard and limited Signature will be available. 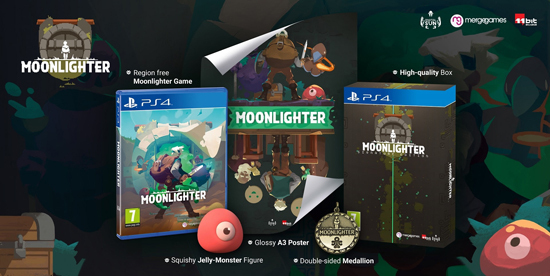 Containing a double-sided Medallion from the game, the Signature Edition also includes a glossy artwork poster and a squishy Jelly-Monster that you can repeatedly squeeze all while thinking about how to economically outsmart other merchants in the village of Rynoka. The game will debut on May 29th, 2018 for $19.99 USD in digital and equivalent in other currencies. The details of the retail version will be announced soon along with pre-order availability. Created by Digital Sun, published by 11 bit studios and partnered with Merge Games for retail distribution, Moonlighter’s story dates back to a time many years ago when a set of magical Gates was discovered during an archaeological excavation. People quickly realized that these ancient passages lead to different realms and dimensions - providing brave and reckless adventurers with treasures beyond measure. Rynoka, a small commercial village, was founded near the excavation site providing refuge and a place for adventurers to sell their hard-earned riches. Moonlighter is an Action-RPG with rogue-lite elements following the everyday routines of the aforementioned Will, Rynoka’s ambitious shopkeeper that dreams of becoming a hero.